Encourages participation in the mission of the Church through prayer, generous sacrifice, voluntary work and the financial support of our sister churches overseas. Enables its supporters to live out their own missionary vocation and to take an active part in building up the Church and reaching out to the poorest and most in need. 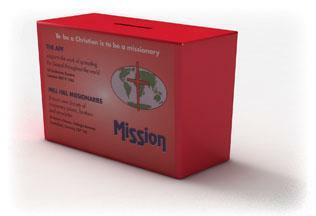 Funds for the Missions are collected through the famous Red Collection Boxes. These can be found in 200,000 homes and they have helped raise millions of pounds for the missions.